Hey, that’s a very good one! What a great quote…one of your best! So good. Sometimes we just need to forget how things might end. Yes, Beth. Why not, not what if. And as Mark Nepo said, you could die of thirst while contemplating a glass of water. The only way to save yourself is to drink it:). I was never one to over think. Sometimes it was costly, but I think it’s mostly brought me great things. 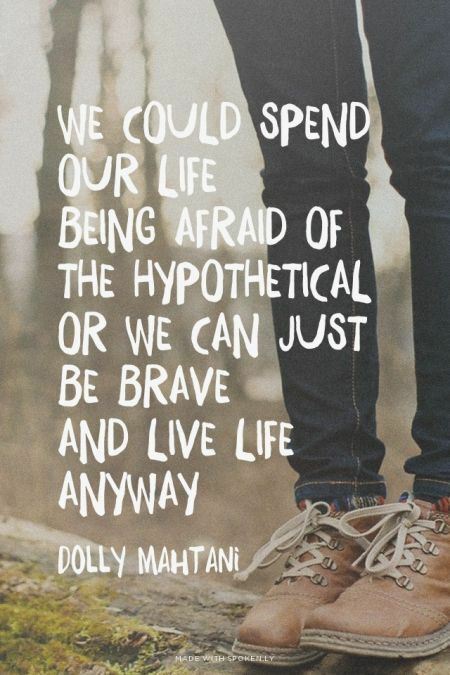 Definitely be brave and live life anyway!! So glad read your blog. Excellent words speaking into the daunting threat of fear & the paralysis fear can bring. and it’s mutual. connections to people are what keep us afloat even when our boat is leaking. Oh my gosh yes. What a great quote. I remind myself that being brave is my everyday! Big view on the world, yes, Beth.